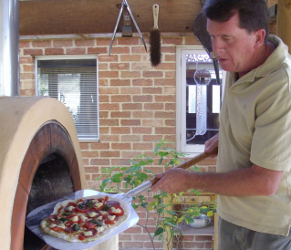 Here are some ideas for a woodfired pizza you may want to add to your list. We usually start most of our pizzas with a tomato base (see below), and top with a drizzle of olive oil and some black pepper (or your favourite herbs). You don't have to use a tomato base, sometimes we just brush with olive oil. 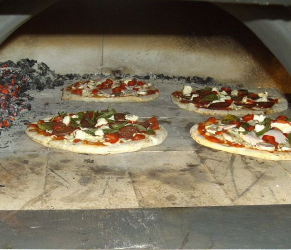 We keep our toppings to light layers as otherwise the pizza will not cook quickly. If you are using fresh herbs add them just before serving or they will burn. You can also use fresh sliced or diced tomato for a base, or simply put the ingredients straight onto the pizza base. Sprinkle yeast and sugar with the warm water and stir, let grow for 10 minutes, then add to flour and salt along with the olive oil. Knead for 10 minutes, place in greased bowl and cover until double in size. Knock the dough back and place back in bowl until double again. Cover with a damp cloth and leave overnight in fridge. Take dough out two hours before cutting into pizza balls and rolling out into bases. 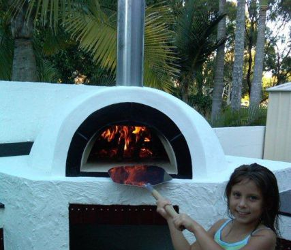 Always use flour under the bases and on the pizza peel. You can freeze the pizza balls at this stage. They keep for 3 months. Makes approx 7-10 pizza bases. You can use a commercial base or make your own sauce to suit your tastes. Or you can just use fresh tomato slices for a sauce base. To make your own easy and tasty tomato base, mix one tin diced or crushed tomatoes, a dash of salt and olive oil, one or two cloves crushed garlic and some finely chopped basil. You can also add any other herbs you feel like. No need to cook the mixture, just stir it well. Makes enough for 5 pizzas. Freezes well too. MARGHERITA The original and the best. tomato base, fresh tomato, mozzarella and fresh basil. INFERNO tomato base, mozzarella cheese, chilies, jalapeno peppers, hot pepperoni, olives, anchovies and Italian herbs. MEAT EATERS Tomato base, ham, pepperoni, capers, olives and mozzarella. For something different, try variations of the ingredients listed below. Anchovy, smoked salmon, oysters, mussels, prosciutto, ham, chicken (cooked), red onion, jalapeno peppers, chili, avocado, artichoke, capers, different cheeses i.e brie, blue vein, jarhlsberg etc, rocket, sun dried tomatoes. prosciutto, blue vein cheese, roasted capsicum. Tandoori Chicken is traditionally cooked in a wood fired tandoori oven so your woodfired pizza oven is perfect for this dish. You can create the marinade from a preprepared bottled tandoori sauce mixed with yogurt or use the recipe below. The advantage of making your own is that it does not contain the artificial red food colouring.